The size and shape of our ears can have a profound effect on our appearance. Abnormally large or protruding ears may look aesthetically unpleasing and can impact our confidence and self-esteem. Non-surgical otoplasty can be an alternative to conventional surgical otoplasty in carefully selected patients. This method restores facial symmetry by correcting the prominently protruding ears to position them closer to the head. Overall, the result is a more aesthetically pleasing look that our patients are satisfied with. The procedure is performed under local anaesthesia while the patient is awake. With this technique, non-absorbable surgical threads are gently placed under the skin using tiny stitches to reshape the anti-helical fold. There is no cutting or suturing involved when closing any wounds. 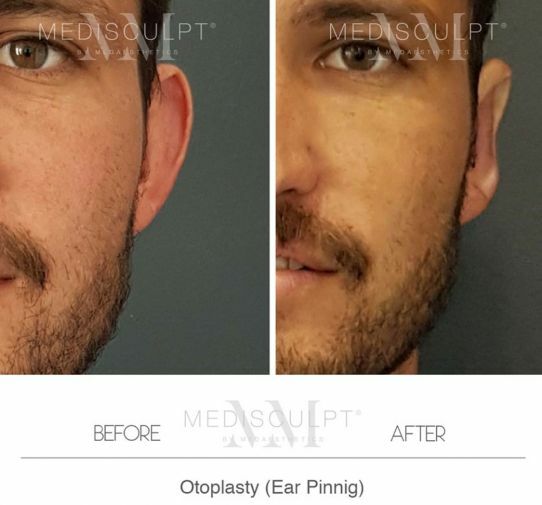 Non-surgical otoplasty is suitable for patients who want their protruding ears to be positioned closer to the head for better facial aesthetics. They lack a well-defined anti-helical fold which needs to be enhanced. These patients do not have excess cartilage at the base of the ears which may require surgical removal. Can I only have one ear treated? Absolutely! We routinely see patients who only have one ear that protrudes more than the other. We can treat just the problematic ear.